Whew! It’s been a while. Thank you all for your well wishes i really had something wicked and i am so happy to be back among the living. And thank you for all the wonderful things you said about my grandma’s stuff-i can’t wait to tell her about it when she calls tomorrow it will make her feel so good 🙂 And we all know crafters like that encouragement. Well this past week has really been about catching up on everything. Stuff around the house, knitting, blogs and really just doing SOMETHING, since i did nothing but lay in bed the whole week i was sick. Sometimes it can be nice doing nothing but seriously i was so happy that i was physically able to move again and have energy that my second day better i cleaned up my whole basement, started rearranging stuff in our bedroom and it felt good-By the end of the day i was so sore and dead tired but i didnt care. I have been doing all kinds of stuff. First up i had a Belle Armoire magazine for my grandma, it her favorite and i needed to mail it but i wanted to put in a little surprise for her. Well originally i wanted to knit a shawl and put that in but i soon realized that would take me forever. 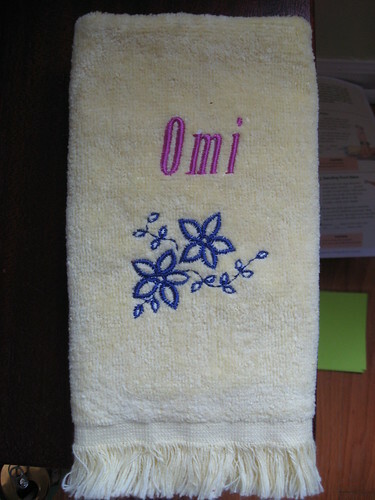 So instead i remembered that she wanted to see how my sewing machine embroiders so i made her a little towel. 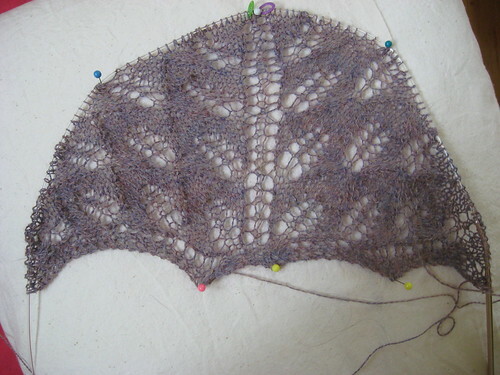 So maybe i went for a quickie project but i am still making her the shawl-It’s the Kiri Shawl (pdf). But that’s not all. I also started another shawl this week-Its a Mystery Shawl-here is the Ravelry link-i think you can still join until tomorrow and then the group closes So Hurry if you want to join!! I only have Clue 1 done. But i am hoping to get Clue 2 done this weekend and since 3 came out today i would have the week to finish it and be all caught up with everybody else. And i can’t forget that i signed up for Summer of Socks so i also have those on the needles. 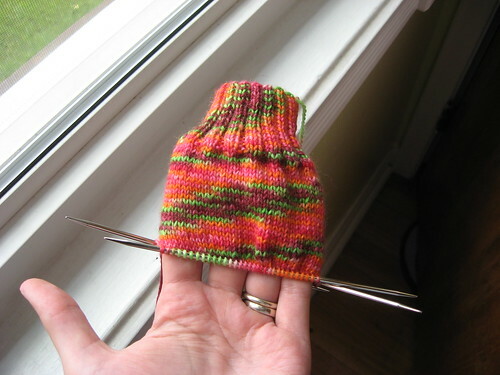 I am already working on the heel of the first sock so this picture is a couple days old. I love the color of the yarn so i decided to just do a plain stockinette. 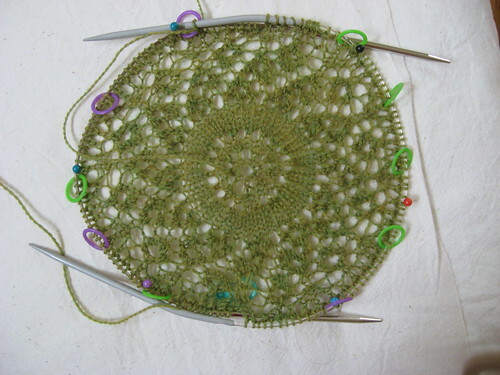 Which i haven’t done yet-i usually always do a pattern. AND lol i still have Little Man’s Cardigan, my squares for my blanket (i only have 4) and i started a surprise for Little Man on Thursday that i should have finished this weekend as well. I have no idea why i have so many thing going i am usually more of a 2 project person but i have really let things get out of hand. its gotten to the point where i am assigning myself time every day to work on a project so one doesn’t linger too long. Other than that things are all going well, hubby has vacation next week so i know we are planning our annual trip to the zoo but i am not sure what else. 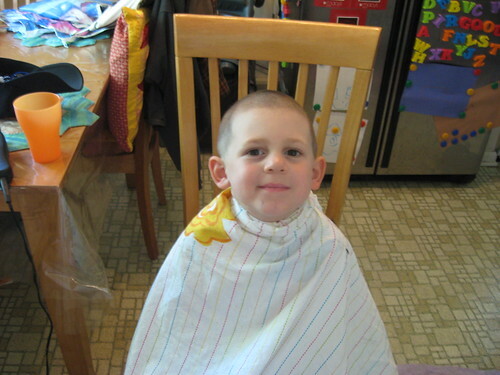 Today i am ending with My Little Man’s summer haircut-we do this every year but it’s still hard for me becuase i like when he has longer hair but i have to think about his comfort before my preferences, and he says he really likes it. it’s actually a tad shorter than we usually so but all hubby had in his shave kit was #4 and #1 so #1 it was-Eeeee… but he still looks adorable and we did save 12 bucks by doing the haircut at home. Aah so glad you are feeling much better and see you knitting mojo didn’t get die out! Strawberry Jam?!? Gurl you are something else! Have a great week while hubby is on vacay!! Little Man looks very handsome and quite grown up with his new haircut. All the knitting looks fabulous! I love the towel you did for your grandmother. She will be thrilled with it I’m sure. My Goodness, you are a busy bee! So many projects – two lace shawls – my respect for you, as I still cannot fight the one I started ages ago… And socks (very Summery colours! ^^), and embroidery, and rearranging the bedroom (that’s what I like to do, move the furniture around from time to time, it gives the feeling of change and novelty). You asked about the crock pot – I don’t think we have something like that in Poland. We have the pot that is called “the fast cooker” or “pressure cooker” but nothing that would cook food slowly (at least I don’t know anything like that).